Megan Yousefelahi, a 2015 Rio Salado dual enrollment graduate from Tempe Desert Vista High School, was recently awarded a Homa and Irene Wood Foundation Scholarship, which will help her continue her educational journey at the University of Arizona this fall. “The Homa and Irene Wood Foundation Scholarship means a chance to get higher education--a chance that I would have not otherwise received,” said Yousefelahi. 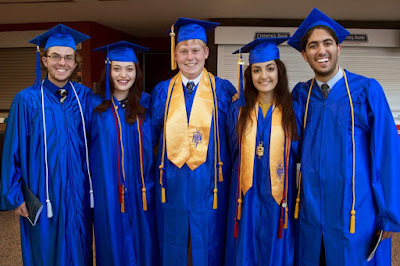 Yousefelahi was one of a record-number of dual enrollment graduates who took part in the May 2015 Commencement ceremony, and among a select few to receive an Associate in Arts and Associate in Science degrees, all before graduating from high school! “What I liked most about being a dual enrollment student was getting the opportunity to earn college credit that could be transferred over to my university,” said Yousefelahi. "It has been so rewarding to work with Megan,” said Rio Salado College Dual Enrollment Site Coordinator Claudia Bermudez. Despite her academic workload, Yousefelahi was also an active member of Rio Salado's Alpha Theta Omicron chapter of the Phi Theta Kappa Honor Society. “Being a member of a highly prestigious college organization gave me bragging rights to universities and scholarships. I was able to interact with college students and provide service to the community,” said Yousefelahi. Yousefelahi plans to major in physiology at University of Arizona before applying to medical school. “I picked medicine as my future career path as a young child because my mother has heart problems (which I too have inherited) therefore I decided to pursue a career involving cardiovascular complications,” said Yousefehali. She hopes her story will inspire others to achieve their educational dreams. “Don't be afraid to put yourself out there. Ask a lot of questions and help with as many projects as you can. High school is a great time to gain experience and knowledge,” said Yousefelahi. Learn how you can make the most of your time, energy and experience in college through Rio Salado’s programs and services.